When last we saw the birther movement, it was grappling with defeat in Georgia. A judge had heard the birthers’ case for blocking Barack Obama on the ballot. The movement was cheered by the possibility that Obama could lose by default when his lawyers, deciding to ignore the whole process, didn’t show up in court. But the Obama side won. Story over. Unless… you’re in the direct mail buckraking industry. This e-mail went out this morning from the would-be MoveOn competitors at RightMarch.com. 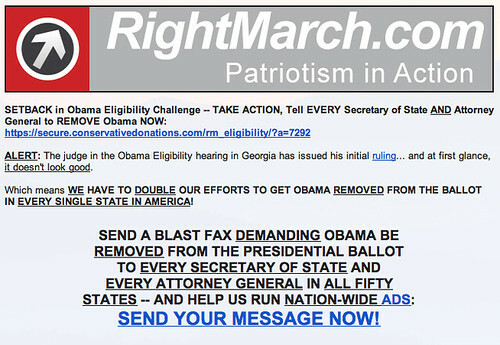 This is… well, I won’t say “a scam,” but it sure isn’t going to get Barack Obama off any state ballots. The only thing it’s guaranteed to do is push cash over to RightMarch. I called the organization to find out a bit more about the campaign and the overheard; the voicemail recommended that I leave a message, then make an automatic donation. Birtherism has returned to the role it was always meant for: A flytrap for suckers.